John Law was born in 1671 to an Edinburgh goldsmith. Goldsmiths were the foundation of the early European banking system, performing basic deposit and lending functions; they would take deposits of gold specie and issue paper certificates which could be redeemed at any time for the gold they represented. 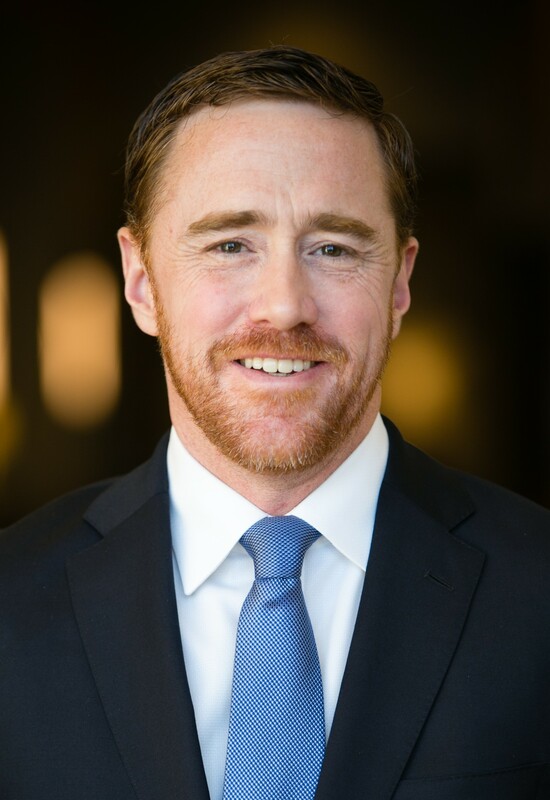 Learning the basic tricks of the trade from his father—and having a gift for calculating odds that made him dangerous in Europe’s casinos—Law was exceptionally well positioned for a career in finance. Law spent nine years on the run in Continental Europe after escaping England and amassed a small fortune before returning to Scotland (English warrants were not honored in Scotland at the time). The Scotland that Law returned to was in the midst of a crisis after a disastrous colonial venture in Panama that wiped out the savings of much of the country’s citizenry. Law’s proposal to get the Scottish economy moving again—which was defeated by the Scottish parliament—was the issuance of paper money backed by the land owned by the government. Law believed that paper money was preferable to gold or silver coinage for several reasons. Paper money is highly portable and fungible, making it more convenient than gold or silver as a medium of exchange and facilitator of economic activity. Law was correct in this observation and noted—as Adam Smith would write more than 70 years later in The Wealth of Nations —that a country’s wealth should be measured by its output, not by its holdings of precious metals. Unfortunately, paper money can also be printed at will. More on that later. Though rejected in his native Scotland, Law’s ideas would soon find fertile ground on the other side of the English Channel. 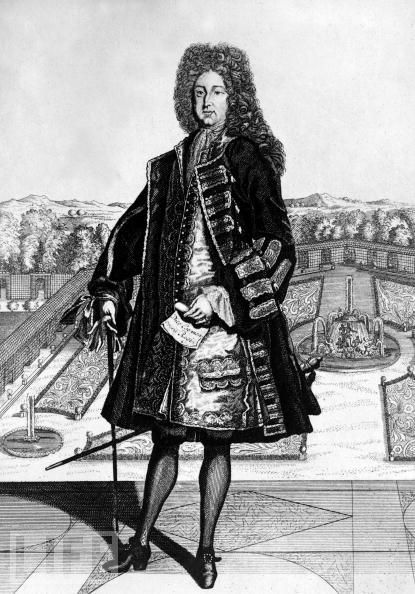 Upon his death, Louis XIV—the “Sun King”—had left France virtually bankrupt. As it turned out, building Versailles and spending decades at war cost money—a lot of money. 3 billion livres, to be exact, while annual tax revenues were 145 million livres. To keep this in perspective, the official U.S. Treasury debt held by the public is $9.1 trillion, and annual tax revenues are $2.2 trillion. That makes the U.S. debt-to-income ratio 4 times, while the ratio that Louis XIV bequeathed to his son was an almost unfathomable 21 times! The interest payments on the debt took up 120 million of the 145 livres in revenues—leaving a mere 25 million to finance the rest of the French government’s expenses. Given that annual expenses were 142 million livres, the French crown depended on further access to credit to keep afloat. Suffice it to say that France was a bad credit risk. Then along came a certain Scotsman. Because Louis XV was only a young boy when his father died, his uncle Philip II, the Duc d’Orleans, became the Regent of France. Philip was in a bind and was willing to try something—anything—to avoid default and collapse. And John Law appeared to have the answer—the creation of new money by a powerful government-chartered bank that would be used to pay off the existing debts. Law would issue stock in the new bank and would use the proceeds of the IPO to buy back government debt. He would also take deposits in coin but issue loans and withdrawals in paper. How is that for quantitative easing? The challenge for Law was to buy back the outstanding government debt at the market rate of 21.50 without driving up the price. If investors discovered the government was reclaiming their billets d’etat and that Philip II could effectively save the royal finances, they would certainly begin asking more than 21.50 per billet. Law solved the problem by offering the bank shares exclusively in exchange for the government bonds. This initial move only retired a small fraction of the national debt, but Law was far from finished. Law built trust in his new paper money by making it redeemable for the full par value in gold coin and went so far as to say that any banker unable to meet redemptions on demand “deserved death.” His rhetoric worked. The French bought into the scheme hook, line, and sinker. In a truly unusual sign of the times, Law’s paper currency actually traded at a 15% premium to comparable gold coins one year into the scheme. As Law anticipated, the jolt in both the money supply and the velocity of money jump-started the French economy. Law convinced Philip II to back a trading company with monopoly trading rights over the Mississippi River and France’s land claim in Louisiana. Shares in the new company would be offered to the public, and investors would only be allowed to buy them with the remaining billets d’etat on the market [i.e. the existing French Crown junk bonds]. So begins the famed Mississippi Scheme. Immediately after the initial public offering (IPO), applications for shares in the Compagnie des Indes started coming in from all levels of society. So many, in fact, that it took the staff at the bank weeks to sort through all the applications. 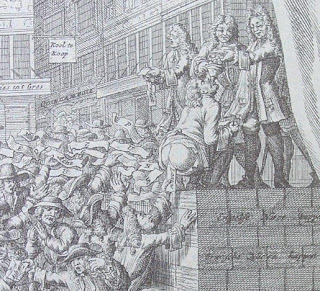 Traders, merchants, dukes, counts, and marquises crowded into the little rue Quincampoix and waited for hours to find out if their subscriptions had been granted. When the final list of subscribers was announced, Law and his awaiting public learned that the shares had been oversubscribed by a factor of six. The immediate result? Shares in the Compagnie des Indes skyrocketed in value. The Compagnie des Indes—popularly called the Mississippi Company—was France’s answer to the Dutch East India Company, but with one critical difference: the Dutch company actually had profitable trading routes. The French trading company had the mosquito-infested bog we today call Louisiana and little else. The investors that piled in were buying shares in a company without any real business model, of course. How exactly Law intended to make money in Louisiana—a land of tepid swamps, not mountains of gold—was never fully explained. Though we can shake our heads at the silly little Frenchmen in retrospect, it is easy to understand their enthusiasm. They were trading in rather junky junk bonds for an exciting opportunity in the New World—an investment that, while ridiculous in retrospect, was no more absurd than buying tech stocks in 1999 or Miami condos in 2005. The “animal spirits” that characterize all financial bubbles was fueled by an exceptionally loose monetary policy, with predictable results. Impressed with the success of the original paper banknotes, Phillip II decided to expand Law’s operation. He renamed the Banque Generale the Banque Royale, made it an official organ of the Crown, and proceeded to expand the money supply by 16 times its previous amount—by literally printing money—and later increasing it by even more. Suddenly, Ben Bernanke’s much maligned “QE2” would seem tame by comparison! Much of the new money went directly into shares of the Mississippi Company. In a matter of months, the share price rose from 500 livres to 10,000 livres (see Figure 1), creating a new class of nouveau riche dubbed “millionaires.” A cycle developed whereby demand for the Mississippi shares would create demand for new paper currency with which to buy them. And Philip and Law were only too happy to oblige. Law’s central bank allowed investors to borrow money at low interest rates using their Mississippi shares as collateral. This would be like the Federal Reserve lending you money directly to buy shares of a new, unproven technology start-up company…using your existing shares of the company as collateral, creating something of a self-contained Ponzi scheme. The entire scheme began to unravel when Law attempted to gently deflate the bubble, which had already led to hyperinflation throughout the French economy and which had spread to neighboring England as well. 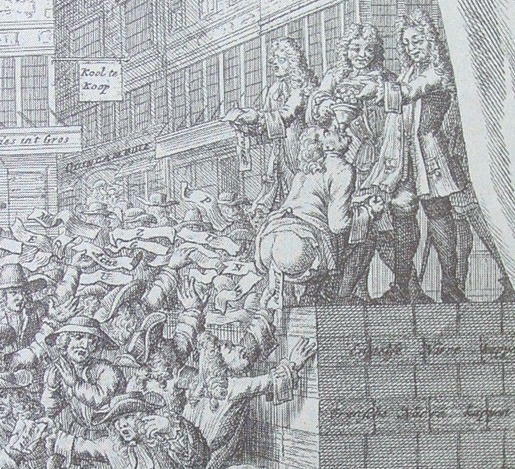 The surge in liquidity created by Law’s scheme spilled across the English Channel and helped to inflate the South Sea Bubble, which had its own excesses nearly as legendary as those of France. Perhaps the most notorious was the successful IPO for “a company for carrying out an undertaking of great advantage, but nobody to know what it is.” It’s hard to imagine anyone actually buying shares in something this ridiculous, but then, is it really any more absurd than lending money for a no-doc “liar loan” on a generic Miami Beach condo? The French bubble was roughly twice the size of the British, measured by the share price appreciation of the Mississippi Company relative to the South Sea Company. Law’s company rose by a factor of 20, whereas the South Sea Company rose by “only” a factor of ten. For this, we can credit John Law’s willingness to liberally offer central bank credit for the purchase of shares! When French investors attempted to redeem their banknotes for gold, it quickly became obvious that there was not enough metal coinage to back the banknotes in circulation. The bank stopped payment on it notes, and Law was forced to flee the country in disgrace. Shares in the Mississippi Company fell all the way back to their issue price, destroying both the newly rich and the established order alike. The only thing more painful than hyperinflation is the inevitable deflation that follows. When the credit markets seized up, the supply and velocity of money plummeted as desperate Frenchmen scurried to dump their worthless banknotes and shares. France and her middle and upper classes were ruined, and the Monarchy was discredited—setting the stage for the bloody French Revolution a generation later. The French developed a strong distaste for banking and capital markets that arguably lingers to this day. The debacle set back the development of modern capitalism in France by decades. As for the investors, they endured a bear market that would make modern investors shudder. Take a look at Figure 2. Though reliable French stock market data is hard to come by, we can use British data as a proxy. The South Sea and Mississippi Bubbles were similar enough to make the comparison a fair one. The sharp spike you see in the chart around the year 1720 is the South Sea Bubble. What followed was 70 years of secular bear market conditions. Stocks did not meaningfully rise again until the 1790s. So much for “stocks for the long run” or “buy and hold” investing! What lessons can we learn from this? One point on which nearly all market historians would agree is that the bigger the bubble, the bigger the bust that follows. Bubbles almost always return to the level at which they started. This was the case in the Mississippi Scheme—the share price rose from 500 livres to over 10,000 livres before collapsing back to 500—and it will likely be the case in the American real estate markets most affected by the bubble of the mid-2000s. Perhaps the most important lesson would be that credit-fueled bubbles always end badly. This was certainly the case with the spectacular collapse of the U.S. housing bubble—which led to the destruction of the banking system—and to the collapse of the Japanese “miracle economy” at the beginning of the 1990s, to give two recent examples. It is popular these days to lay all blame at the feet of the Fed for keeping interest rates artificially low. In the U.S. housing bubble, this is not really accurate or fair. The Fed played its part, of course, but so did irresponsible bankers, mortgage brokers, real estate agents, and even the home buyers themselves. The Fed’s actions in the aftermath of the bust are what have generated the most controversy. The Fed has always engaged in “open market operations,” buying and selling U.S. government securities in an attempt to regulate the money supply. But this has evolved from a purely monetary objective to becoming a de facto funding mechanism for the U.S. government. The government is effectively printing money at the Fed in order to lend it to itself when the Fed uses that money to buy bonds that it will likely never sell. Though not quite as egregious as the Mississippi Scheme, whereby money was printed to buy inflated shares, there are obvious parallels. Not too shockingly, this has given credence to “gold bug” hyperinflationary views that have been in the closet since the end of the 1970s. The gold bugs have been “wrong” in the sense that the inflation they feared has not yet materialized (and likely never will for demographic and deleveraging reasons I’ve discussed in prior articles). But their fears were enough to send gold to new all-time highs. The question on everyone’s minds is “what happens when the Fed eventually has to reverse course?” When the Fed takes the punchbowl away, bond yields should rise and most risky assets—like stocks—should fall. But when? And by how much? The volatile stock correction that started in late spring coincided with a lull in the Fed’s easing. Given that stocks have had an unusually good run in recent months, we might expect a similar decline once the effects of QE2 wear off, or perhaps something much worse. Regardless, we should learn from the lessons of history. Quantitative easing is dangerous and does not “fix” a bad economy. It does, however, generally lead to destabilizing asset bubbles. The quantitative easing following the “dot com” bust helped to create the conditions that made the housing and mortgage bubble possible. And today, we have incipient bubbles in gold and food prices forming. Again, using history as a guide, the most likely outcome is a prolonged period of deflationary conditions and tepid growth. For a well-written account in more digestible modern English, I recommend Financial Reckoning Day by William Bonner and Addison Wiggin (which was recently republished). Bonner and Wiggin devote an entire chapter to Law’s scheme, and most of the precise figures used in this article were taken from their book. Niall Ferguson’s The Ascent of Money is also a great modern source. Ferguson tells the John Law story within a broader historical context, drawing parallels to other bubbles throughout history. This article first appeared in the HS Dent Forecast newsletter.